The 2017 Mercedes-Benz E-Class sedan lineup is one of the most impressive collections of vehicles you will find on the roads of Poughkeepsie right now. These midsize sedans turn heads wherever they go while delighting whoever happens to be in the cabin. By combining refined performance, sophisticated style, and high-tech features together into one sensational package, the E-Class has distinguished itself as one of the leading luxury midsize sedans available for Fishkill drivers Learn what the lineup has to offer, then visit us for a tour and test drive at Mercedes-Benz of Wappingers Falls. The introductory version has an MSRP starting at $52,150, and it offers a phenomenal amount for that price. Under the hood is a turbocharged 2.0L four-cylinder engine that delivers 241 hp and 273 lb-ft of torque and can reach 60 mph in just 7.0 seconds. The engine is paired with a nine-speed automatic transmission and sends power to the rear wheels. Despite all the power at your disposal, this sedan returns impressive fuel-efficiency ratings of 22 mpg city and 30 mpg highway. The MSRP for this configuration starts at $54,650, but you get a lot more in terms of performance for that additional cost. This sedan runs on the same engine and transmission as the previous version, but power is sent to all wheels though the models 4MATIC® system. This system monitors when wheel are slipping and automatically supplies them with a boost of torque so that they can preserve grip. In practice, the 4MATIC® system allows you to handle tough terrain and inclement weather with more confidence and improve the agility and handling of the sedan on any road. 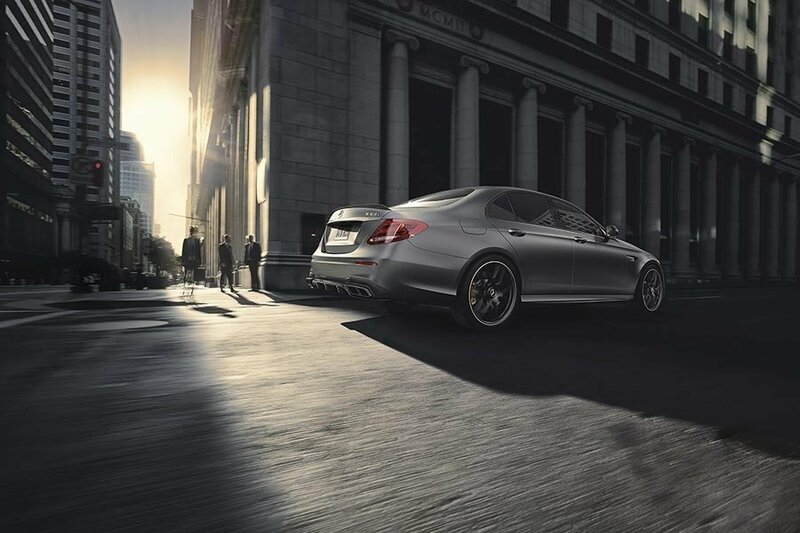 Drivers who value the thrill of the driving experience above all else will love what this sedan is capable of. The powertrain is a turbocharged 3.0L V6 that boosts power ratings to 396 hp and 384 lb-ft of torque and improves 0-60 mph speeds to just 4.5 seconds. The engine is paired with the same refined nine-speed automatic transmission, and all-wheel drive comes standard. This sedan is equipped to turn heads and raise hairs, and the MSRP starts at just $72,400. 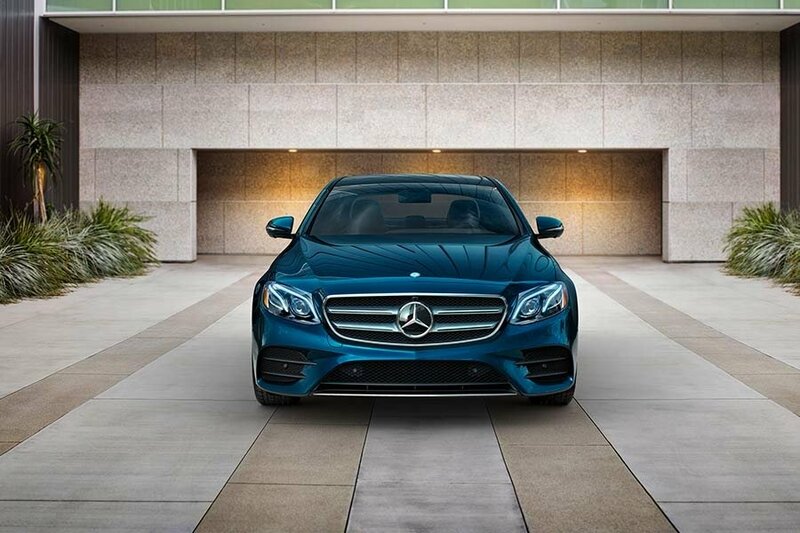 The best way to describe the overall look of the 2017 E-Class lineup is stylishly sophisticated. Every configuration shows off sleek lines, subtle accents, and a seamless commitment to design that gives this model a one-of-a-kind look. The sedan comes standard with bold LED headlights, heated power-folding mirrors, and a sunroof to let in the wind and warmth. You also have the option to upgrade the exterior with features like keyless entry, larger wheels, and a number of unique style upgrades. E-Class sedans are equipped with the kind of cabin that makes you want to keep driving. There is spacious seating for five and 13.1 cubic feet of space in the trunk. Every aspect of the interior shows off a commitment to refinement and a careful understanding of what drivers and passengers really want. Standard interior features include dual-zone climate controls to keep everyone comfortable and simulated leather upholstery that is stylish but still durable. There are also power-adjustable front seats and a 60/40-split folding rear seat for more carrying capacity. You can further upgrade the interior with features like heated and ventilated front seats and full leather upholstery. 12.3-Inch Display – This standard feature makes it especially easy to access all your cabin controls and infotainment options in one place using intuitive menus and a bright screen. 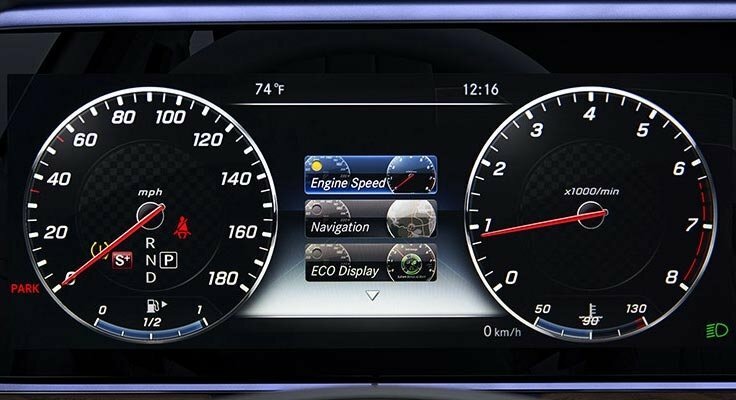 You can take advantage of navigation, Apple CarPlay and Android Auto, HD radio and much more. DYNAMIC SELECT – Selectable driving modes allow you to automatically re-tune engine and suspension variables on the fly and drastically alter the way your sedan drives so that it meets your exact requirements at all times. Advanced Safety – This lineup of sedans is available with an expansive list of advanced safety features including forward collision warning, blind spot monitoring, lane keep assist, and many more. Wireless Phone Charging – Instead of contending with cords and tangles, simply place your phone on a pad in the center console and it will automatically begin charging. Dead batteries are thing of the past. Test out the technology along with everything else this lineup has to offer at our dealership in Wappingers Falls. We have a wide range of inventory in stock and generous financing offers available to more drivers. Take a tour and test drive at your convenience, and contact us with your questions.